Submitted by Blue Devils' brass caption head John M. Meehan: Blue Devils have already held three of their five brass auditions for the 2007 season. With a southern California and second Concord, Calif., audition remaining before Christmas, more than 125 hopeful members have already presented their musical and visual talents for Blue Devils brass staff in Indianapolis, Dallas and Concord. In anticipation of the upcoming 50th anniversary season, many students who have attended were invited to continue their audition at the January camp and several—including three from Japan—were accepted outright into the corps. A major highlight in this audition season was the acceptance of Kendall DeJong, a baritone/euphonium player who has auditioned for four years and marched in the Blue Devils B for the past five years. Visit www.bluedevils.org for more information on auditions. Submitted by Carolina Crown's executive director Kevin Smith: Carolina Crown had a great first audition camp of the 2007 season Nov. 17-19. A record turnout of both auditioning students and returning members made for an exciting start to the 2007 season. In addition, still scheduled are remote auditions in the Indianapolis (Dec. 3) and Austin, TX (Dec. 10) plus a second audition camp in South Carolina (Dec. 15-17). 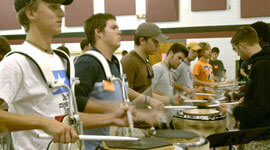 Percussion students during Carolina Crown's November audition camp in Rock Hill, S.C. There are currently students from 30 states as well as England, the Netherlands and Japan registered to participate in this year's ensemble. Visit www.carolinacrown.org for membership information.